Enable Windchill search to support ‘pure’ latest iteration search when additional criteria is applied. Current behavior: with latest iteration search is performed with State ‘In Work’ then all ‘In work’ objects are searched and later latest iteration filter is applied on it. 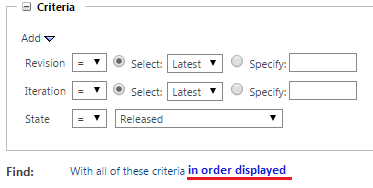 If you search multiple objects, you will receive duplicated results (which would add up to a wrong search result).The system should be able to show only the real latest object (the “current”) and not the latest from all states. So a "pure latest" search criteria have to be add to the search function in Windchill. This has drove us nuts. I whole-heartedly agree. It is different in PDMLink from Intralink 3.4 and lower. If I put a criteria of latest objects at In Work then if the object is at 2.2 at Production Released but 2.1 is In Work then I don't want that object to display at all! Totally agree. Multiple users have misunderstood search results, and costly mistakes were made. The actual functionality is different than users expect. Practically all users depend on Advanced Search, and it is nearly impossible to explain this crazy functional issue to everyone. It sounds like what you really want is a priority to the search criteria and then the ability to change that priority. First filter for all lastest revisions, then filter for all latest iterations, finally filter for all 'Released' objects. I think this might already have been fixed. Note that Part 1 version A.3 was NOT included in the results, which is what the original post seems to be addressing. Whether or not Part 2 appears is set using the "Latest Version Search" preference -- but that is dealing with revisions, not iterations. This is actually very concerning if it's no longer possible to locate an object where both Criteria are true. What if you really meant: 1.) find all "in work" objects then 2.) filter this set by the latest one of each? We do this today for "latest" + "released". Just because something has been revised to "in work" doesn't mean I should stop seeing the "latest released" version. Either we need a "pure" latest search (as the idea suggested), or we need to set the priority of the search order (search for "A" first, then filter this by "B", and so on). If the latest release of Windchill really does change this functionality, then we are in serious trouble. Latest released data needs to continue to remain available from search, even if there is newer unreleased data in the system. And you would want to search for the latest version of "MyPart1" that's in the "Released" state -- in other words, you want a search that would return MyPart1 version A.4. Is that correct? One way to do it would be to search for Iteration=All and State=Released, but that search will return version A.3 and A.4. But I can ask the search team if they can think of a way that this might be handled. Yes, this is how it works today (10.2 M020). I want to make sure I don't lose that functionality. What version are you testing on? 10.3? By the way, I think this drives much more than just search. If we have users who are only allowed to see objects that are released, they should still be able to find and display the latest version of those released objects in search, Creo View, structure browser, etc. I was testing on 10.2 M030. But you're ok -- this didn't go away. I think the difference is latest revision vs. latest iteration. Searching for a non-latest iteration is more complicated. -- Which is how you seem to be using it, and it continues to work as expected. Which is likely exactly what you want! But strictly speaking, the most recent revision of Part 6 to be in the Released state is version C.2. But since C.2 is now a non-latest iteration, it's ignored by Windchill search.